LED resistance calculator use to determine the series resistor needed to connect various series combinations of light emitting diodes or "LEDs". LED resistance calculator will assist you pick the resistors make the connections for any number of LEDs. 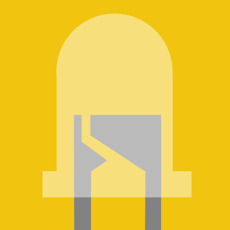 Every (LED) light emitting diode has a current that they can handle safely. Going beyond it maximum current will damage the LED. So limiting the current through the LED with the use of a series resistor is a common practice. LED resistance calculator will help you determine the value of the resistor so you can add in series with the LED to limit the current. Just input the indicated values and the result will be calculate automatically. The result include Resistor Value, Resistor Power Dissipation and Recommended Resistor Wattage. Vf - LED voltage drop. The voltage drop on a LED depends on the color it emits. If- LED current. The usual operating range of common 3 mm and 5 mm LEDs is 10-30 milliamps. * This method is not recommended for high current LEDs, which need a more reliable switching current regulator.